This field trip has been SOLD OUT. If you would to be placed on a wait list please contact us here. Observe prairie chickens from inside the cover of a blind during the sunrise mating dance or “booming” at Prairie Ridge State Natural Area. Use of viewing blinds at Prairie Ridge State Natural Area is by reservation only. To minimize disturbance to the prairie chickens, visiting the blind and booming grounds without a guide is not allowed. While this field trip can be exciting and rewarding, it comes with some cautions and restrictions. Please read all the information below before making your reservation. Registration is limited to members of Illinois Audubon Society only. A maximum of 12 registrations will be taken for each morning. Six people per blind. The trips will be conducted regardless of the weather. This trip is not suitable for children under the age of twelve. More details including lodging suggestions will be sent along with registration confirmation. All participants will meet at 4:30 a.m. in the parking lot of Cobblestone Inn in Newton on the morning of the field trip. This will allow time for the group to be seated in the blind before the prairie chickens arrive on the booming grounds. A field trip guide will lead the caravan to a designated parking spot near the blind, lead the group to the blind and will remain with the group throughout the experience. Everyone must be able to hike 0.25 mile on muddy, uneven terrain from their car to the blinds with minimal light. Participants should expect to be in the viewing blind approximately five hours. Once the group is seated in the blind, participants are not allowed to leave; there are no restrooms or heat in the blinds. The structures are approximately 15 ft long x 8 ft wide x 8 ft high. Caravanning from the hotel is encouraged and appreciated. We will return to the hotel before the 11:00 a.m. check out time. The group will not wait for late participants to arrive at the Cobblestone on the morning of the field trip. Once the group has departed the hotel parking lot, anyone arriving late will not be able to participate. Participants will be seated on wooden benches in an enclosed blind with a guide. Small pillows or seat cushions may be used. Each participant is allowed to bring along one backpack or duffle bag. Maximum carry-in size is 17” x 13” x 10” (approximately 35L). Space is limited in the blinds. Please be courteous to the other guests and stay within this size restriction. With the exception of binoculars, blankets, seat cushions and tripods, EVERYTHING must be transported in a backpack or duffle bag. This includes camera equipment. Participants will need to stay inside the blind until the birds have finished courtship displays and flushed the lek. 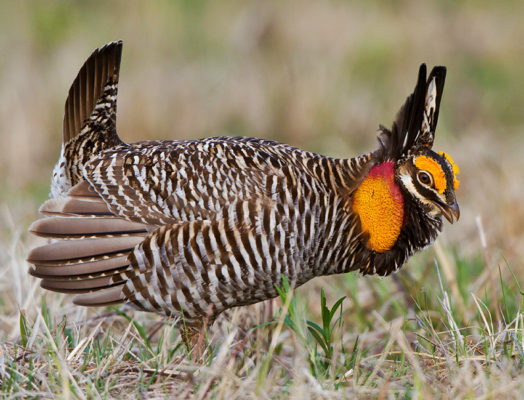 This is determined by the prairie chickens’ behavior and cannot be precisely scheduled. Your guide will determine when participants may leave. Be advised that there are no bathrooms in the viewing blind or anywhere close to the lek. We recommend that you limit your liquid intake prior to the viewing tour. Bathrooms will be available immediately following the viewing. Keep noise to a minimum during all parts of the trip. This includes parking, exiting your cars and hiking to and entering the blinds. Snacks are allowed – please be courteous and quiet when munching. Cameras are allowed; all tones set to silent. We realize that shutters make noise, but some cameras have tones for other functions and these can be alarming to the birds. Photography is permitted for personal use only. NO flash photography is allowed. Flashes of light will disrupt the birds’ natural activity you are there to observe. There will be ample time after sun up to take pictures. Be patient–take time to listen to the ethereal audio performance of the birds as they arrive at the lek before first light–it’s quite magical! You are allowed to bring a tripod for your camera, but you will be asked not to fully extend it. Room is VERY limited in the viewing blind! The viewing blind has a small shelf for table top tripods, which is a good alternative to a full sized one. Date: April 6, 2019 Time: 4:30 a.m. - 10:30 a.m. Subscribe to “Sightings,” the Illinois Audubon Society email newsletter. Receive updates on programs, events and news.